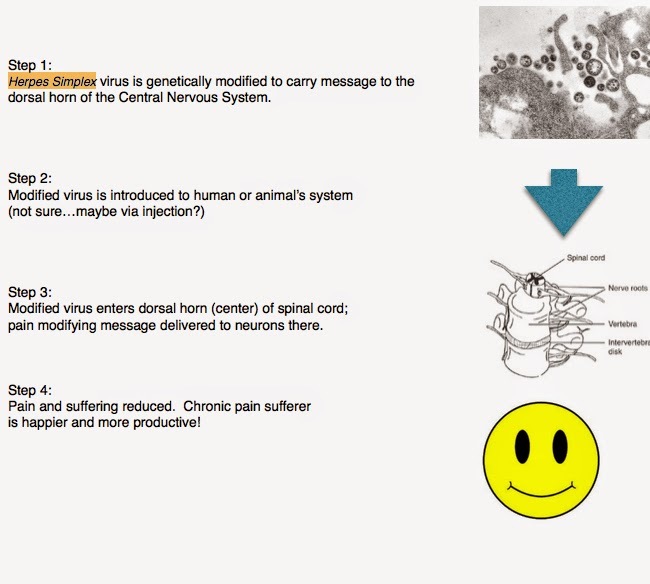 According to a March 2014 article in Pain Medicine News, studies are underway to assess use of the Herpes Simplex virus to deliver genetic instructions to the central nervous system to "rewrite" pain signals at their source. After having success in animal models, the studies continue in human clinical trials. It is entirely possible that this will become a safe and effective approach to chronic pain management in three to five years. Dr. David Fink, a neurologist at the University of Michigan in Ann Arbor, and Joseph Glorisio, Ph.D. from the University of Pittsburgh, along with their colleagues at Periphagen Holdings are taking the lead in this new and exciting frontier in pain management!